For over 33 years, I have been proud to serve the dental needs of my patients here in our Bedford community. I enjoy providing ethical, evidence based dentistry to all of my patients. I feel honored that you have chosen Bedford Cosmetic and Restorative Dentistry, and it is my greatest goal to always deliver attractive, long-lasting, and well-designed dentistry to you and your family. Before bringing healthy, beautiful smiles to Bedford, I attended the Georgetown University Dental School, graduating in 1983. Between 1983 and 1987, I served as a lieutenant for the United States Public Health Service and was the director of dentistry for Florida Rural Health Services. 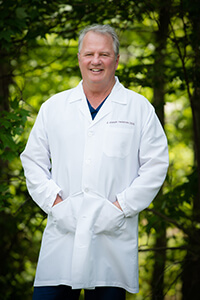 I am a graduate of the Dr. William Strupp Postgraduate School of Dentistry, and in 1987 I opened my private practice right here in Bedford. In addition to my formal education and training to become a dentist, I regularly participate in continuing education as a way to learn about and offer my patients the latest, and most advanced dental treatment options. I am a member of several professional dental organizations and study clubs that offer continuing education opportunities including the American Dental Association and the New Hampshire Dental Society. In my spare time, I enjoy spending time with my family. I also like to golf, cook, and read. I look forward to working with you and your family, and sharing so many wonderful smiles in the years to come.